I wrote a book (NaNoWriMo 2018) One of the main goals for November was to complete the NaNoWriMo 2018. I did that last year too, and it was a huge success. Unfortunately, this year, it was unbearably hard (due to personal life experiences). At one point, around 38k words, I decided to give up. Then I stressed myself to continue and, at the last second, I won with just 50,004 words. I have not very much to say about that. This year NaNoWriMo was a super grindy and not very enjoyable experience. But I did it anyway, and I am happy I did. Speaking of books; in the last two months, I worked on rewriting the fourth edition of a book on Artificial Intelligence for Unity. 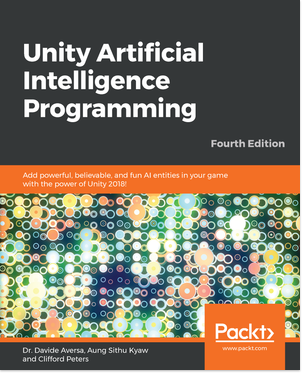 The book is called Unity Artificial Intelligence Programming - Fourth Edition. Most of the work was about updating code examples from Unity 3.x to Unity 2018, a very destructive process. Then I rewrote most of the sections and added a chapter on Machine Learning. In the end, due to time and life constraints, I wasn’t able to do all the changes I wanted to do. Oh well. I think the result is quite good, but it is not me that should say that! New Blog Articles I had a nice interactive article about Random Walking that I wanted to publish in November. Even if everything goes south, I would like to post it at least it in December! Random walking is very important, not just for movement, but for simulating realistic behaviors in values such as prices. Moving Out I told you that I am changing my home city. This goal is actually on hold. However, I am more determined than ever in this. As soon as I have the time, I’ll continue my quest. Speaking about work and things I wanted to do, November has been a good month: doing NaNoWriMo and publishing a book in the same months is a real challenge. I am proud that I make it through! Unfortunately, for everything else, it was a pretty horrible month. For this reason, I don’t have a lot of insights or a lot of conclusions. There are still a lot of things that are going on.